This 2.25 oz travel size container contains 90 applications of life stinks extra-strong cedarwood dry deodorant. Perfect for your gym bag or carry-on. No liquids, no gels - no problem at security! This easy-to-use, travel-safe, twist-top container, is made of high-grade plastic and cannot be refilled. 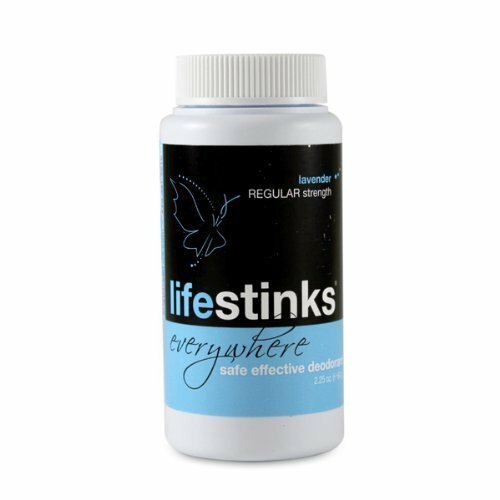 Therefore, we recommend that lifestinks users use lifestinks everywhere on the road and continue using their earth-friendly, stainless steel refillable lifestinks container when at home. As always - No aluminum, no talc, no stain. And now, no worries when you are away from home. If you have any questions about this product by Duggan Sisters, contact us by completing and submitting the form below. If you are looking for a specif part number, please include it with your message.